Love, Life & Locks (London): Changes! Changes! Changes! A recent comment to one of my non-hair posts cheekily asked me about my hair and what it was like now *grin*; I had assumed that the xmas pics were good enough to tide y'all over - but clearly not lol, so here's an update. When compared with my installation, my hair is looking much fuller. Is this due to pregnancy hormones or is it a result of 9 months of new growth and my hair relaxing into its locking pattern? I'd like to think it was the latter, but I have this niggling worry in the back of my mind that someday (someday after this baby has been born) my hair will fall out again and once again I'll look like a stickle brick or a hedgehog. I mean - after rocking full twistouts and curly fros for a few years - you can tell I wasn't feeling the skinny plaits on my head. I did like the pliability of the baby locs, I could fold them around a curler for even as little as an hour and I'd have a wicked set. Braid outs and bantu knots were also a doddle. I had so many options and had to be careful because (it seemed as though) my hair strands were abandoning my head by the thousands! My hairline - particularly at the temples was especially fragile. Time, love and patience have allowed the fragile (baldy) bits to recover... and I now have a crop of 7 stubby locks (about 2 inches long?) on one side and a similar group on the other. Mostly these babies are kept hidden by creative styling *giggle*. The main reason for me 'hiding' them is because they keep coming undone and it was a right pain to have a curly afro in the middle of the other locs... twisting them around eachother and then around more stable neighbouring locks has given them time to 'catch themselves' so they stay in their interlocked pattern and have a chance to grow (i.e. lock up). These have been my main bug bears throughout this journey. Well, that plus the dreaded hair loss lol! 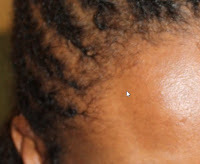 You start out with perfectly uniform size 0 locs... and a couple of months later your head is full of mutants! Pole or Number 1 shaped loccies turn into figure 8s or 'qs and bs'. Ends unravel or mysterious holes appear in the middle for seemingly no reason at all! You learn to take it all in stride. You realise that you can't control your hair journey any more than you can control the weather. "It will do what it do". I used to really be in a panic about it - wondering if I was going to have a mix of skinny and thick locks, and I think SLers may worry a lil more than other lockers on account of the money we've invested in our heads - but I've decided that it'll all work out in the end. I'm not the first to experience bunching and from looking at the blogs and fotkis of those who've gone before - in the end, it'll be all good - so, no more stressing for me. Since my son likes to 'swing' on my locs (yes, he'll grab a fistful from each side of my head and lean back as far as he can go without falling!) I keep my hair covered as much as I can when I am at home (with HIM) and when I sleep. Mind you, that swing test is a good myth buster for all those out there who think SLs are too small and will just break your hair. I'm still using my loc soc but this one is getting a lil loose (lil man likes to pull this too) so I don't style it out of the house anymore. I've considered satin pillow cases and bonnets but at the moment I am still far too lazy to be bothered. Why am I covering my hair - just to minimise the amount of lint/dust etc that can find its way into my locs. I also find that the soc helps my stubbies (baby locs) to lie flat - I really don't need to be walking around looking like a hedgehog. I've also added fractionated coconut oil to my haircare routine - it's incredibly light. I mix it with sweet almond oil and apply a few drops to my scalp every now and then. So far so good. Not much of an issue anymore. 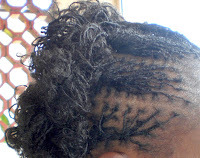 I had that scenario where I found the dreaded white stuff stuck in a few locs mostly at the nape of my neck; for me this was not helped by banding as the bands were preventing a thorough rinsing out of the shampoo etc; so I abandoned banding after 3 or 4 months. I still braid but I can't spend ages in the shower doing my hair when I've got little ones banging on the door, so I'm sorry but most days I just wash as normal (I can see some of you saying - that's probably why my ends have unravelled and you may be right - but what's done is done lol). Of course, I don't recommend that SLers stop braiding and banding before their consultants advise them to - it was mine who suggested I stop, had she not mentioned it I'd probably still be a faithful SLer today *giggle*. When I saw Chi from Hair by Chi back in December, he had soaked the offending locs in ACV (Apple Cider Vinegar ) and lovingly tended to my babies before styling. 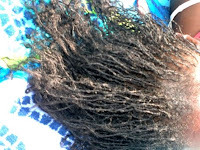 Ladies, this man is so tender with your locs you will not want to leave his chair! Plus the conversation is always either stimulating or hilarious (hahahah just thinking about it). I've also learned that the key to avoiding/handling buildup is in the rinsing. Sure you can use clarifying shampoos if you like but I'm wary of using them (too much) because they really dry out the scalp and if you already have dry scalp you wanna avoid them like the plague. As regards rinsing, think of it this way. Imagine if you were not locked, you'd probably shampoo, rinse (once or twice) then repeat right? (Generally speaking). So in this case you wanna either dilute your shampoo or use smaller amounts - whatever you prefer (and I'm referring to co-washing with conditioners as well when I use the term 'shampoo'). Once you've lathered up, paying more attention to your scalp than the locs: if you're a faithful SLer or 'new age' traditional/braid lock rocker it's unlikely that you'll have much product in your hair so you don't need to slather the lather over the locs as much as you need to focus on cleaning your scalp. Fingertips (not fingernails) work just fine on your scalp to lift any muck off your head (remember to be gentle!) 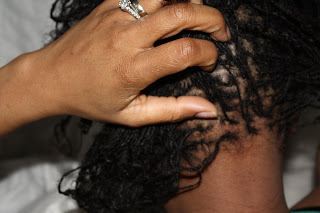 Gently squeeze, pat or smooth the lather down the length of your locs so they get their turn but try to avoid any scrubbing or vigorous rubbing motions - particularly if frizz is an issue for you. When you've finished each braid or cluster of locs, rinse. Then rinse again. And again. And again. Basically you wanna rinse at least twice as much as you would have done with your previous hairstyle (i.e. permed, natural, whatever). If your hair can stand it, use the shower head and angle the jet appropriately so it gets to all the locs (especially the ones at the nape of the neck and all lower layers as the suds from the top locks are likely to be seeping into those underneath). As much as this adds time to my hair washing routine, I can say without a doubt that it has been helping me keep the buildup at bay and so I'll be sticking with it. Let me know if it works for you. With my temples recovering, I've become more adventurous with my hairstyles as well - substituting a lot more flat twists, buns and ponytails for the everyday straight looking 'freestyle'. I'll try to post pics of these in later posts but y'all know how reluctant HRH is to take hair shots, so it'll have to be when my daughter has time to help me. Thanx for sharing bc I really needed to read about being patient today.I nearly had a breakdown this morning over my hair. (build up and slippage issues) Reading your post shows me I can get past it. Your hair looks both thicker and longer. As for braiding, a girls gotta do what a girl's gotta do.All different twists and turns in the journey. As my locks have seen to go through a growth spell, I also wonder if it's hormones or my hair actually growing. However what I fear the most is losing my hair after I have the baby, I already wen through it once and really don'c care to go through it again. 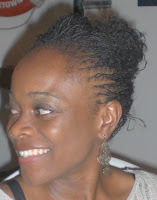 Your hair is looking good, I love the twists! @CP - if you're talking about the updo that was maybe 3 or 4 days after installation so yup my hairline was freshly done lol. Pregancy and hair - hair generally always grows during this time. Most women with african ancestory try not to put chemicals in their hair during pregancy. When I was pregant my hair achieved the longest length I had ever had - prior to locking my hair. So locking my hair was as good for my hair as pregancy, but longer than nine months.